BREAKING NEWS: The proposed date of the Presentations Night, Saturday 18th May has had to be changed and a new date will be announced as soon as possible. Watch this website and social media for further news. BREAKING NEWS: The proposed date of the Presentations Night, Saturday 18th May has had to be changed and a new date will be announced as soon as possible. 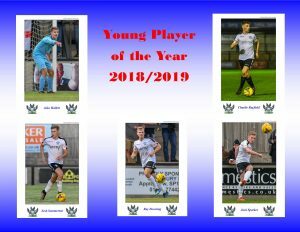 In the meantime you can still vote at the last home game on Saturday 27th April for PLAYER AND YOUNG PLAYER OF THE YEAR and online at the end of the Season. Your chance to win £50 by voting for your Player and Young Player of the Year. 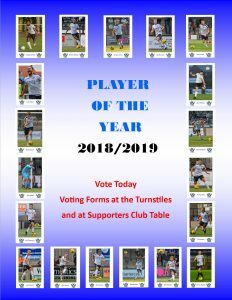 Pick up you voting slips at today’s game, and put your vote in the collecting box by the programme sellers table at the turnstiles or Supporters Club table in the bar. 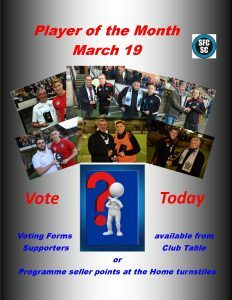 You can vote here for your favourite Player of the Month for April and the winner will be announced at the Supporters’ Club Special Presentations Night on Saturday 18th May. You can only vote once. 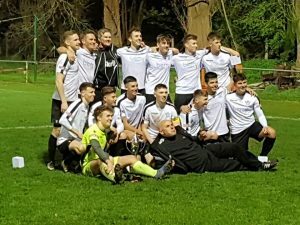 Congratulations to SalisburyFC Development team on winning the Wyvern Cup last night, after beating Baffins Milton Rovers 2:0. SalisburyFC Player Diego Romero also picked up the Player of the Match Award. The Supporters’ Club table is upstairs in the Sarum Suite Bar at all home games and the Committee Members can be found in the stands watching the games!